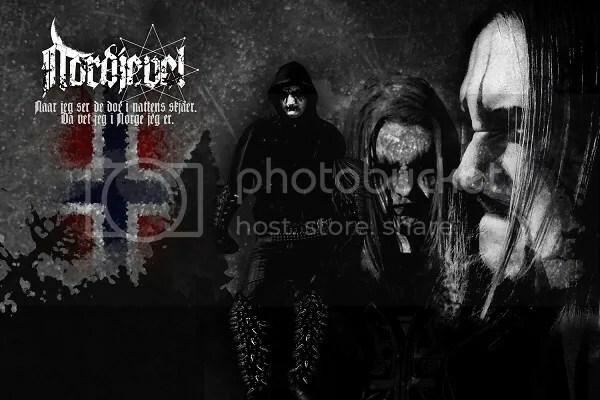 Within a very few short months of announcing the band’s formation, Scandinavian Black Metallers NORDJEVEL have inked a two album deal with France’s Osmose Productions, and, whilst no exact date for the debut full-length album has been set, it is expected that the album, which will be titled “Nordjevel”, will appear before the end of the year. New though the band may be, its members, which include Doedsadmiral (SVARTELDER, DOEDSVANGR) on vocals, Nord (FATAL IMPACT, TVANGESTE, BYRDI) on guitars and bass, and Fredrik Widigs (MARDUK) on drums, have a wealth of experience and include some prominent musicians from the Scandinavian scene. It is a lineup whose debut track instantly caused a flurry of interest amongst Black Metal fans and media alike, and attracted a number of offers from serious labels. Commenting on the decision to sign with Osmose, the band said: “They offered us a very good deal of course, but they also didn’t tie us up with a lot of conditions and restrictions which was a very important factor for us . The label has also worked with SLAGMAUR, which is one of our manager’s bands, so everyone already knows how everyone else works, and hopefully it will all be a seamless operation and a strong partnership”. NORDJEVEL was founded by frontman Doedsadmiral (who was formerly known as Djevel, but who changed his name for the sake of consistency in all his projects) and guitarist Nord earlier this year, when, following a series of conversations the two found that they shared the same views on Black Metal, the Occult and the origins of Norway. The two Norwegians were soon joined by Sweden’s Fredrik Widigs on drums, who fitted right in and contributed significantly to the writing and arranging on the album. Whilst Widigs’ commitment to his other projects pretty much preclude him from committing to appearing live with the band on anything other than the odd occasion, he is, nevertheless a full-time and committed studio member. NORDJEVEL, which translated means “Northern Devil” are currently putting the finishing touches to the album and the artwork, which itself promises to be something very special, and are preparing for live appearance. It has already been revealed that TROLL’s Nagash will be one of the guests on the album, and more information will be revealed in the near future.